First, I’d like to beg for you not to read too closely into this post. I took a 2-hour nap this afternoon, and while it was amazing, I’m not “all here,” if you know what I mean. I’ll be the first to admit that I enjoy Halloween, and not for the reasons you might assume. Aside from all the controversy that surrounds this holiday, I love it because it reminds me that Thanksgiving is only a few weeks away, which then ushers in Christmas. And we all know that I’m obsessed with Christmas. Obsessed. You won’t be able to get rid of me, I’ll be blogging so much. I mourn as I put my tree away on Tim’s birthday. Which is June 7th. 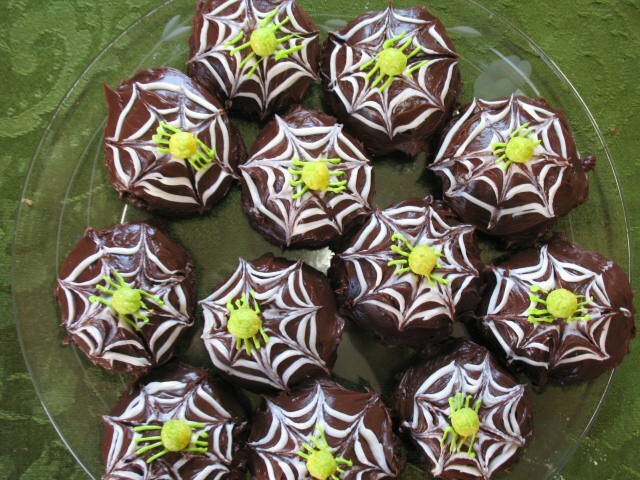 My mom’s friend, Holly, made these adorable “spooky” cookies and sent the recipe along to me. It was originally posted on Bakerella’s site, which is absolutely fabulous and noteworthy. I’ll post the recipe exactly as it’s seen on her blog. Thanks again, Holly! How cute are these? I hope you all have an amazing Halloween, or harvest festival, or whatever you celebrate! Just as long as there are pumpkins, cookies and fall involved, I’m down for whatever you want to call it.